They do mark "Clues from the Quilt "
Fa la la la la la la la la"
Oh, yes, a December yarn bombing it was. The Vine Street Yarn Storm honors the many citizens whose names are on the Melrose History Quilt. 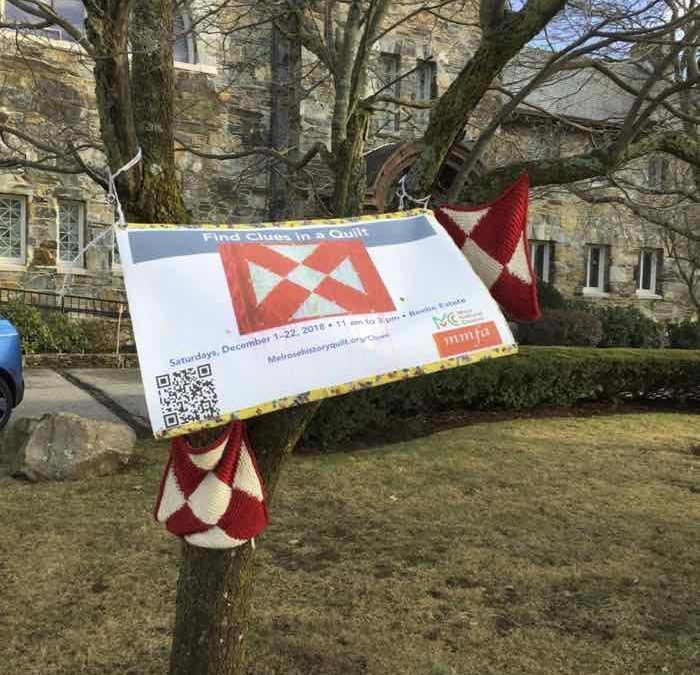 Seven locations in Melrose, MA were hit by a “yarn storm” during December 2018, as part of a the Melrose History Quilt homecoming celebration. What is a yarn storm? 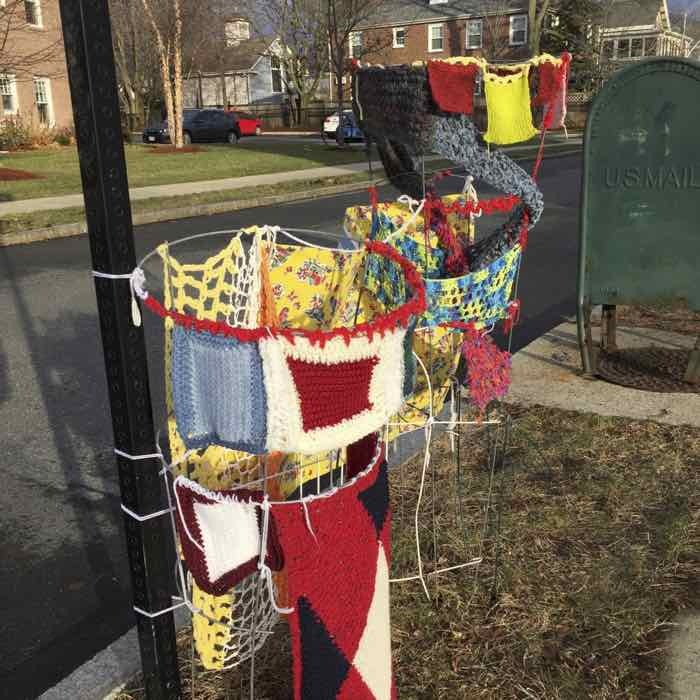 Also known as a yarn bomb or graffiti knitting, it’s an installation of knit and crochet items with a goal of expressing a public statement or to just personalize a sterile public space. Involve community ideas about the yarn installation. Organize public knit and crochet sessions for contributors to mix. Identify allies: craft guilds, knitting groups and yarn stores. Ask for permission to install the yarn storm on private property. It doesn’t hurt to mention it to the public works department when installing on public property. Use large base components. Of course, you could have everyone make two inch squares or tiny sea shells and put your yarn bombing together, but similar sizing and larger sizes facilitate joining pieces and making an impact. We asked people to make squares and rectangles using multiples of six inches (i.e. 6″ x 6,” 6″ x 12,” 6″ x 18″), which was perhaps on the small side considering we targeted seven locations in town. Either fewer locations or larger base pieces would create more impact. Use support structures that can be installed indoors, then set up quickly outdoors. At two locations, the yarn blocks and banners were installed on fences, which went up quickly. At other locations, old campaign yard signs, wooden shipping supports and wire tomato cages were decorated indoors, then set up outside. By joining pieces as they were contributed, it made installation at the end less daunting. Stitch together contributions as they arrive. We installed the yarn storm during the week after Thanksgiving. Having snowed shortly before Thanksgiving, the soil was pretty hard. Cold temperatures and stiff winds reduced the amount of time mitten-less fingers could properly function. Plan time for yarn bombing maintenance. Depending on the goal of your yarn installation, keep in mind that winter weather can be difficult on yarn bombings. If you can assign group members to check on the installation, many hands will make light work. For “Clues from a Quilt,” a 42″ tomato cage tipped over in high wind. There wasn’t enough top soil to truly support the taller structure (the 36″ tomato cage did just fine). “Clues from a Quilt” also included banners to direct people to the web site. If I ever organize another winter yarn storm, those banners will be printed on fabric or mesh to better withstand the wind. Whew! This is one place where you don’t want to skimp on your expenses. After the homecoming was over, we took down the yarn storm pieces, washing them and storing for the next opportunity to…. Fa la la la la la la la la..."